There is no substitute for products with superior quality and excellent performance. When it comes to bringing out tangible and high-quality products, the shop floor management software can provide the ultimate solution. The software can manage all the key components of a shop floor including material, equipment, quality control, and storage to simplify the operations. In other words, you can improve the shop floor management significantly by establishing cooperation between the manager and the staff. Customized shop floor solutions aimed at making the production planning process smooth and seamless by involving inventory, equipment, workers, and administration. Such solutions can help industries achieve the following objectives of shop floor management with the help of technological advancements. It is interesting to know how customized shop floor management solution can serve these objectives while offering the following noteworthy benefits. Which are major benefits of shop floor solutions? Here are big advantages of shop floor management software in the production planning. The smooth and swift flow of information can lead your business toward success. The software can increase the speed and accuracy of information flow by managing it properly. The software can provide up-to-minute analysis and enable you to get complete control over the supply chain. Also, you can identify the production areas that need your attention. Legacy and obsolete production systems rely on manually entered data, and therefore, they are not as efficient as the advanced technology-based solutions at finding issues. The shop floor solution can identify the areas where productivity needs improvement. It can save valuable time of project managers by automating the process and enable them to focus on other core activities. In a way, profitability is increased and overheads can be decreased. It is easy to allocate resources for other important tasks as the shop floor software can handle the production process efficiently. The automated process leads to more efficient resource planning and contributes to increase productivity. You can get real-time data, project insight, and supply chain-related information with ease. It makes your employees more efficient and dedicated to achieving their goal. Also, accurate presentation of corporate data improves transparency and increases the credibility of your business. It is easy for your employees to find issues and resolve them as they can get all the information on the floor management dashboard. It significantly reduces the reaction time also. The production flow, supply chain management, and other aspects of manufacturing units need real-time information to act faster. The shop floor management tracks every step of the production cycle and provides the real-time information to make insightful decisions. The shop floor management aims at providing instant support of the teams across various divisions. The solution can provide real-time information and establish a seamless communication among concerned executives to resolve the issues soon. It can help businesses remove the ‘operational blindness’ by enabling various departments to work together. In a way, you can save big on time and operating revenue. These days, various readymade shop floor solutions are available to meet the diverse requirements of production processes. You can either select anyone from them or customize the solution with features related to production needs. You can contact a reputed shop floor management solutions provider to get a new customized solution or modify the existing one for addressing production process-related needs. From efficient resource planning to fetch accurate data, the shop floor management solution can enable your company to reduce cost and increase productivity. Your manufacturing unit can leverage the benefits of thriving technology and stay ahead of the competition with enhanced production process and planning capabilities. Silver Touch Technologies is one of the most reliable and reputed SAP partners globally. 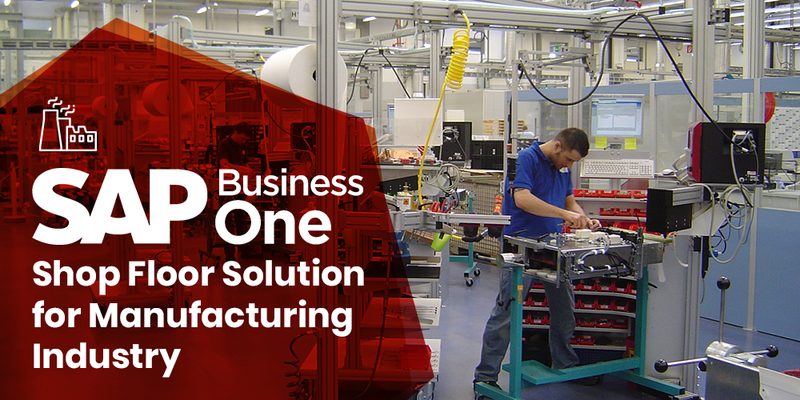 We have an SAP Business One integrated Silver Shop Floor Management solution with robust capabilities. The manufacturing industry can leverage the benefits of our readymade solution to ensure a seamless production and enhanced productivity. Data accuracy, machine-wise process costing, quality check, and resource planning are some of the most notable features of our shop floor management software.